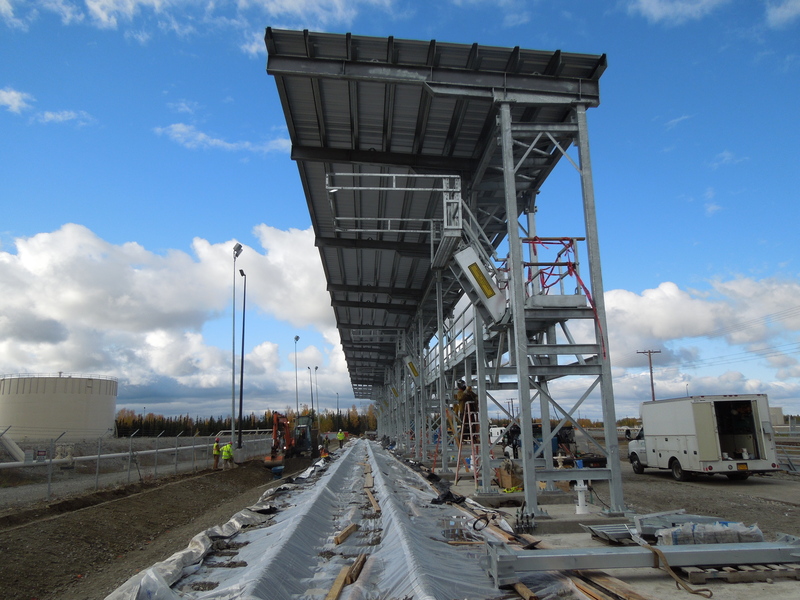 Working for the US Army Corps of Engineers Alaska District, EEI was the prime engineering consultant responsible for planning, design, and construction administration support for a railroad rehabilitation and tank car fuel off-load project at Eielson AFB near Fairbanks, Alaska. EEI provided all civil, mechanical fuels, and structural engineering design as well as project management. EEI also directed the efforts of the subconsultants throughout the project. The purpose of the project was to remove and replace substandard railroad track, and provide new rail spurs needed to support a 1,000,000 million gallon per day fuel delivery requirement to support strategic aircraft. The project replaced over 1.2 miles of substandard railroad tract, and included 1.5 miles of new track to create railroad spurs that accommodate a string of 50 fuel tank rail cars. The existing tank car off-load positions were removed and replaced with 7 new tank car off-load positions (pictured above). Enhancements included a new walkway platform and canopy structure to provide access to the top of the tank cars, upgrades to facility lighting, a remote spill containment area, and new swivel offload connection points. The project also included new track crossings at roadways, drainage improvements, and modifications to overhead power lines.